Stop look glisten: our First-Class Fancies are certainly not Mr Kipling’s cakes nor are they pointless gewgaws!! 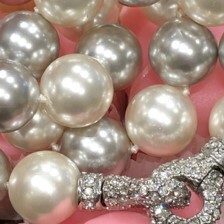 What they are though, are exceedingly good jewels at exceedingly good prices!! You will no doubt agree that there is no greater pleasure in life than a little indulgence and we have a most splendid confection of treats!! A mix of metallics, gold and silver which will keep you bang on trend, making the taste theoretics applaud!! A large, lustrous Pearl necklace with a sparkling silver and zirconia clad clasp; chic Citrine gold ring; shape specific rectangular gold hoops (be subversive go rectangular) and a One Pound Note wrapped into a Locket (what’s not to love, a gilded mint)! The list goes on just click on the images…. PS We capitulated; we scoffed the “Nations Favourite” saccharine fancies! Every single one of them! Fancy that!